 KTM's super-secret 800cc twin adventure model gets caught out testing. 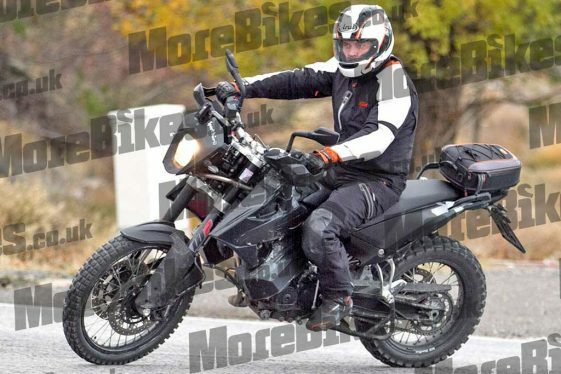 New photos emerged today of a pre-production 800cc KTM Adventure out road testing, and they are some of the clearest pictures to date of this highly-anticipated new model. KTM has long been a dominant force in the Adventure Touring segment, but a middleweight twin has been noticeably absent from their lineup. An 800cc KTM adventure model has been rumored for some time and was recently confirmed by KTM head Stephan Pierer. The bike has not yet been officially named, but assuming it follows KTM conventions, we can expect it to be called the KTM 790 Adventure. The new KTM 790 adventure model will feature an 800cc parallel-twin engine, with a 270° crank, and is expected to produce somewhere around 100hp. The powerplant will be mounted in a completely new chassis, with an overall focus on weight savings and off-road performance. Riding on a 21″ front wheel and 18″ rear, with beefy 43mm WP forks and a healthy amount of suspension travel, the KTM 790 Adventure will likely set a new off-road performance bar in the big-twin ADV category. To keep it competitive on the sales floor, KTM will need to price it somewhere in the $13,000 range. In the spy photos, we see a small headlight assembly with missing windscreen and fairing panels. 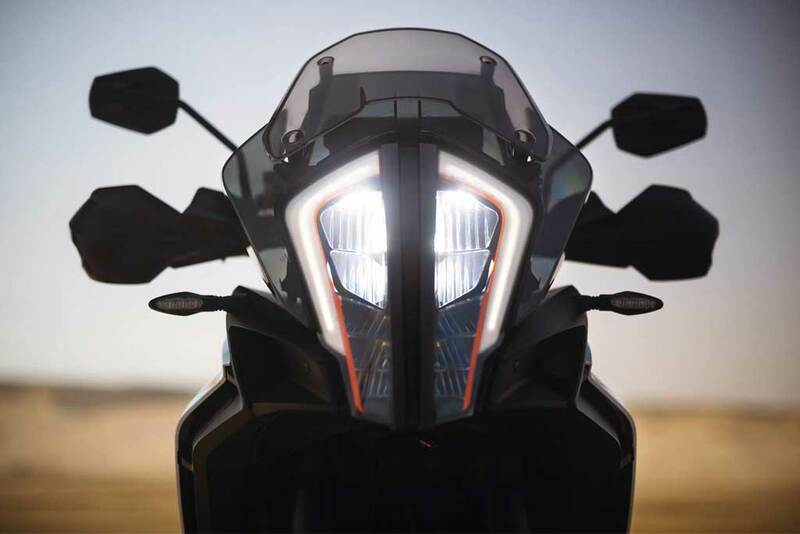 The bodywork will most likely look completely differently by production time and we’d expect it to incorporate the same vertically-split headlight design found on the 2017 KTM 1290 Super Adventure R — a new design style appearing on many of KTM’s street models. Look for the new KTM 790 Adventure to be announced in late 2017, released as a 2018 model. 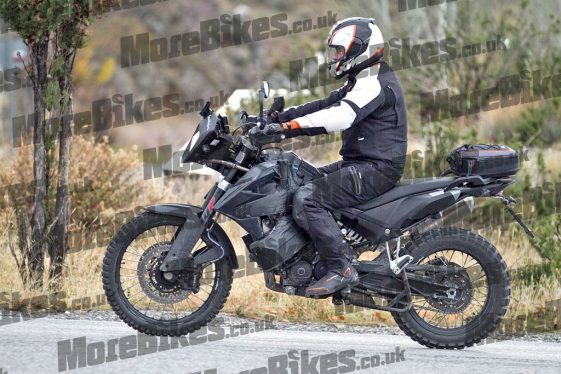 Expect the styling of the new KTM 790 Adventure to incorporate the same vertically-split design found on the 1290 Super Adventure R.
For more information on the spy photos, visit morebikes.co.uk. That said, I can’t abide the new light/fairing design motif: it is truly hideous and reminiscent of some kind of alien insect. Oh yeah – Such crap design from legendary design house Kiska! Your idea would be? I agree. not liking that new “vertically split design” too much. I wish they did the headlight styling close to what the rally bikes have. I think the Yamaha T7 concept headlight looked so much better. I agree, wtf just make it look somewhat like the rally 450 and call it a day. 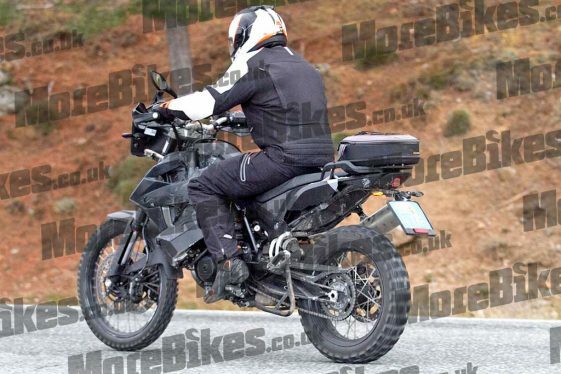 Love these new ADV bike spy photos and concept bikes we have been seeing. Seems as if some of the manufacturers are finally coming around. Looking forward to see how the final production unit turns out. Perhaps this is the bike that could finally make me go orange. I also dislike the new headlight assembly shown, but not because it’s ugly. I read the text that stated it’s not likely to be whats shown above. I applaud the use of dual lamps, if that is whats shown, even if the cost increases somewhat. Reason is, the cycle is targeted to get off-road, but you have to *get there*, as in ADV. Dual lamps in today’s road conditions are a must have. Now to why I don’t like the design shown: It creates a light-gap down the center. That’s right in front of the cycle. That’s silly! Forget style, Gimme light in front of my cycle! (Not easy to do, with side projecting LEDs). An 800 cc cycle at 100 HP, that’s a stressed motor. We’ll see how well that can be built to the suggested price point. (Speaking to quality of build, and perhaps design). “light-gap down the center”… nonsense. I suspect the dual lamps are high beam, low beam, as on all KTMs, but stacked side-by-side instead of vertically (for example on the KTM 1190 R). So on low beam, one lamp will be lighted, and on high beam both lamps will be lighted, one pointing down and the other pointing ahead. The engine and exhaust can seem well protected, good! Nothing hanging out underneath, good! 21 frt, 18 rear, yes! 6 speed manual, right? Check! The rear sub frame, tho. Hmmm, I can not tell if that is a center stand, or part of the sub frame coming up from the passenger pegs. I hope it’s frame I see, otherwise, did you see that looooong sub frame rail? Can you say “easy to break, easy to bend”? One more: Do Not give me a rear subframe like the current crop of 690 / 701s. I can not hang anything on those plastic frames / gas tanks, without a $2000 external frame Rally kit. Nope, I can do better than this, after a cost like that. That T7 concept is an awesome looking bike. I hope however that Yamaha is wise enough to keep it as close as possible to the concept (specially that sweet looking headlight). We knew this was coming along with the T7. Truth be told, it’s an after effect of the AT…..specifically mentioned from the head of KTM himself. Even here on ADVpulse you called the AT the next gen. To me the market is shifting and we will be looking back on this new generation of sub 1000cc ADV bikes as the time before the AT and the time after. Honda can be thanked for this new KTM but only KTM can be blamed for the gladiator headlight oddness……I’m not a fan no matter how much better it might be in corners. Anyway, the panic to me is at BMW as they HAD the ADV market by the nuts but now their nuts are taking a good pounding. LOL. All their stuff to me looks WAY outdated, over engineered, too expensive and too complicated. Honda AT weighs the same as KTM 1190, after you add the centerstand and crashbars that the 1190 comes with. Honda does not influence KTM design, thank God! How about the 390 adventure? I’m waiting. Are you listening KTM? What is the seat height 31″? This may be a game changer … perhaps it’s time to think about a shift to KTM. Hope they do a fairing reminiciant of the old 950 adv. Also would have liked to have seen the 48mm forks from their off-road line up make there way onto this thing. The 1090 didn’t use it, so why would the lower rent 790 use it? Speculation adds nothing to what little is offered here.